Regular readers of my blog will have heard me rave about the amazing Rajeunir Moisture Serum. (Read my review here). I’ve fallen in love with the brand because of my experience with this product and the lovely people that run the company. When I heard that I would have the opportunity to review two more of their products I was really excited to try them. The brand is all about making women over 40 look and feel their best and I felt sure that these hair products would do marvellous things for my hair which tends be dry at the ends from too much colour and heat. As you can see the presentation is slick. The bottles fit right into the clean lines of my chrome and white bathroom. The pump dispenser is really handy to make sure that you don’t get too much out all at once and I was pleased to see that the shampoo is clear and completely colour free. It has a pink grapefruit fragrance although I couldn’t immediately place what it smelled of and had to ask. As I applied the shampoo it went on really well, lathered nicely and after rinsing my hair felt squeaky clean. I felt that this was a good thing initially, as often brands are so gentle that they don’t remove the build-up of products. On reflection, I feel perhaps the product was a little too harsh – for my hair type at least – and that it took away too much of the natural oils. “Rajeunir Shampoo is a unique formulation containing natural fruit and vegetable extracts, which stimulates hair growth and helps to reduce hair loss. The shampoo protects the hair and scalp against everyday stresses and environmental damage leaving it moisturised, repaired, smoothed and free of frizz. On to the conditioner. Again scented with pink grapefruit it was a lovely consistency and I spread it through my hair allowing it to soak in for a minute or two. After rinsing, my hair felt strengthened but not particularly moisturised. As I dried it looked really shiny and strong but unfortunately this formula left my hair with lots of fl­y­­­-­­aways and I needed to use some oil to give it the sleek glossy look I prefer. 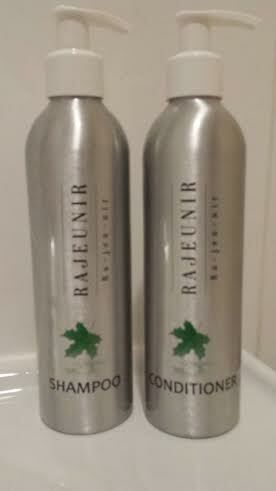 “Rajeunir Conditioner is a unique formulation containing natural fruit and vegetable extracts, which leaves hair feeling soft, tangle free and fully hydrated. The conditioner protects the hair and scalp against everyday stresses and environmental damage leaving it moisturised, repaired, smoothed and free of frizz. I’m a bit disappointed that the didn’t live up to my expectations and I think that it’s probably because with only one shampoo and one conditioner rather than a range that you select according to your hair type this formula just wasn’t the one for me. I’m hoping that Rajeunir develop other variations or alternatively add to the range with a serum or other finishing products. Rajeunir are a new and developing brand and I know they listen and will take on board feedback to constantly improve. I look forward to trying out future products. Let me know if you’ve tried out these products and if they suit your hair.